Selection of Thread, Floss, and Wire can be a personal choice. 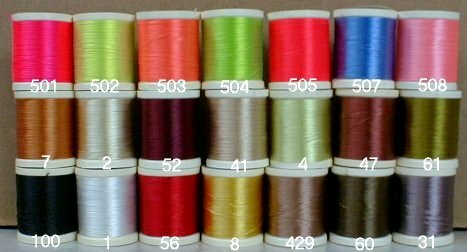 Thread can be based on Silk, Nylon, or Polyester materials. Each has their own merits. Most thread, today, is polyester. It is easy to handle and has a good breaking strength. Many threads are rated by diameter such as 3/0, 6/0, 8/0 etc. This gives you a relative sense of thread diameter but can be misleading in comparisons to other threads. The industry standard is denier which measures the weight of the thread. Generally the higher denier, the higher the breaking strength of any given type of thread material. Polyester and Nylon have very similar breaking strengths while silk is less strong. 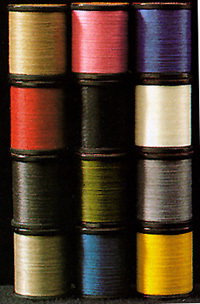 One of the oldest and most recognized thread companies. All of their thread is nylon except the Rayon Floss. Nylon has exceptional dyeing abilities, thus a wide range of colors. It is also stronger and more abrasion resistant than silk. Nylon also tends to be stiffer and smoother than Polyester. Rayon has similar characteristics to silk and is used mainly for floss as a man-made substitute. 19 colors available, waxed in 100 yard spools, unwaxed in 50 or 100 yard spools. Good for flies larger than size #12. Used for flaring small amounts of hair such as hoppers. Denier is 116 with a breaking strength of 26oz. 25 colors available, waxed or unwaxed, 200 yard or 50 yard spools. A flat fine thread with low bulk, good for small flies of size #10-22. Probably the most widely used thread in the world. Denier is 79 with a breaking strength of 16 oz. 21 colors available, waxed or unwaxed, 100 yard 1 spools. A flat waxed Nylon with some twist. Good for large hair flies and need for high tensile strength. Denier is 237 with a 61 oz breaking strength. 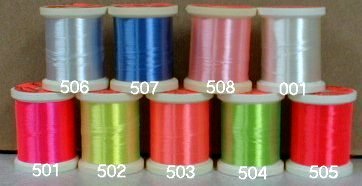 9 colors available, 20 or 100 yard spools, 4 strand in 10 yard spools. 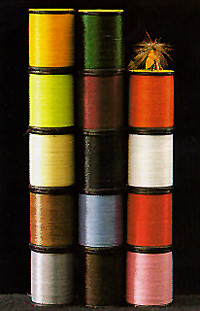 Gudebrod sells a wide range of thread for both fly tying and rod building. Their thread is a polyester. Polyester is similar to nylon except that it is not as elastic. It also will not dye as well as nylon. It does have less stiffness and more roughness than nylon which makes it a little easier to use in fly tying and it lays down flatter. All of their threads are flat and waxed. 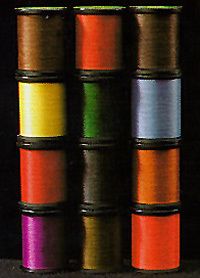 Gudebrod's spools are constructed with a thread retainer sleeve. Gudebrod 8/0 and 10/0 are favored by many fly tiers for very small flies and sparse bodies. 26 colors available, Good for flies #6-14 and for small hair flies such as hoppers. Breaking strength is 34 oz. 17 colors available, Good for small flies siz #14 -20 and large flies where bulk needs to be reduced. Creates small heads. Breaking strength is 15 oz. 15 colors available, Good for very small flies under #18. Breaking strength is 9 oz. Uni, a small Canadian company, sells the largest range of colors and types of threads. Most of the thread is polyester. They use a rosin wax which helps to prevent bobbin clogging. Uni takes pride in their labeling which is permanently adhered to the spool. 17 colors available. Flat multifilament polyester. Unwaxed or waxed in 50 and 100 yard spools. Used for larger flies greater than size #12, good for covering bulky areas. Denier is 213 and Breaking Strength is 40 oz. Colors: Black, Brown, Fluo. Chartreuse, Green, Gray, Iron Gray, Dark Brown, Light Blue, Light Cahill, Olive, Orange, Pink, Red, Tan, White, Wine, Yellow. 24 colors available. Slightly bonded polyester filaments. Unwaxed or waxed in 50 and 200 yard spools. General Purpose thread good on large dries, beadheads, and streamers needing high strength. Abrasion-resistant. Denier is 135 and Breaking Strength is 33 oz. Colors: Black, Camel, Doc.Blue, Green, Gray, Iron Gray, Dark Brown, Light Blue, Light Cahill, Olive, Olive Dun, Orange, Pink, Purple, Royal Blue, Rusty Dun, Red, Fire Orange, Rusty Brown, Tan, White, Wine, Yellow, Chartreuse, Lt.Olive. 23 colors available. Slightly bonded polyester filaments. Unwaxed or waxed in 50 or 200 yard spools. Used for small flies size #10-22, low bulk tying. Thread lays flat and is not twisted. Texture of thread helps to secure materials. Denier is 72 and the Breaking Strength is 16 oz. Wapsi Ultra thread is very similar to Danville's since both are a flat nylon thread. The nylon provides for a little bit of stretch. Wapsi utilizes a denier system to categorize thread thickness. They have also provided spools which are more user friendly with a built-in thread retainer. Labels are color-coded and well marked. Comes in 18 colors and 4 sizes: Denier 70, 140, 210, and 280. Denier 70 is for small trout flies #10-22 with a breading strength of 16 oz. Denier 140 is best for medium sized trout flies #6-14 and fine hair work with a breaking strength of 33 oz. Denier 210 is a good thread for large flies 1/0 to 8 and for most hair flies, particularly deer hair, braking strength is 50 oz. Denier 280 is for heavy hair work and attaching dumbbell eyes with a braking strength of 66 oz. Wapsi produces 22 colored copper wires in five thicknesses: Brassie, Large, Medium, Small, and Extra-small. Brassie is for size #12-20, Medium for size #6-12.